These slow roasted grape crostini with goat cheese and walnuts with a drizzle of honey are truly sublime. They’re a yummy vegetarian appetizer for a fall gathering or they’re also great to serve for a cheese course. Confession: I almost forgot to post today. I mean I had the recipe all ready to go and all. And I absolutely love it, it’s just that we just had an awesome fun busy weekend, and all of a sudden it’s the 22nd and I haven’t even looked at the photos I took yet. I don’t know if this is happening to you all as well, but the nature of our weekends has totally changed about 180 degrees all of a sudden. Now we are at home (no more time at the lake) and I am in a frenzy of nesting. No more basking in the sun, dinking rose and playing corn hole, dreading my annual skin check with my dermatologist who is going to yell at me and tell me to stop skimping on the sunscreen, and no more catching perch on the dock. Nope no more of that. We’re back to weekends at home. The birthday party circuit is in full effect. Holy moly! And thankfully, I am all full of energy. I am not sure if there is such a thing as the fall equivalent of spring cleaning, but if there is, I have that goin’ on big time right now. I moved into my office a year ago. And I don’t feel like I ever really moved in properly. All of a sudden in the last five or six days, I am crazy motivated to get everything in tip top shape. I actually filed a pile of papers that was about 10-inches thick. Then this weekend rolls around and all of a sudden Jase and I did like a months worth of chores in two hours. He spent the day on Saturday installing a fence around my garden. Ha ha take that Mr. Rabbit, or actually I guess it’s his Great Grandson. I taught three tracks of BodyAttack at BodyResolution for the first time ever on Saturday. That was hard and fun and I can’t wait to do it again tonight. And then I had an awesome Sunday BodyPump class, and Emily came. She was there every step of the way while I did my pump training. Also on Sunday we limbed up all of our river birches, and moved the compost. And I planted winter rye in my poor pathetic garden. And Jase built me a beautiful new surface for shooting from old barn boards that were out in our friend’s field. (Can’t wait to use that!) And I tested six, yes six, new recipes for my cookbook. Some were awesome. Some need a LOT more work. And my 8-year old and I built a huge fort in the woods. And then I’m like crap! The roasted grapes! I have to write about the roasted grapes! So here we are, it’s Monday, and I have some lovely little appetizers for you. I am sorry to not have a ton to say about them. 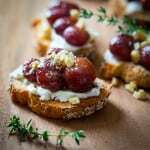 They sort of fall somewhere between this fig and blue cheese mini tarts and these beet and goat cheese bruschetta. They are sweet and savory and really surprising. Jase even called me from work the day after I made them to tell me how awesome they were. If you have a Pinterest board devoted to appetizers and party food like me, pretty please I’d love it if you would pin them. And please be sure to leave me a comment and tell me how your weekend went. Did you work around the house? Did you get in any workouts? Are you in Fall nesting mode too? Did you preserve any produce? 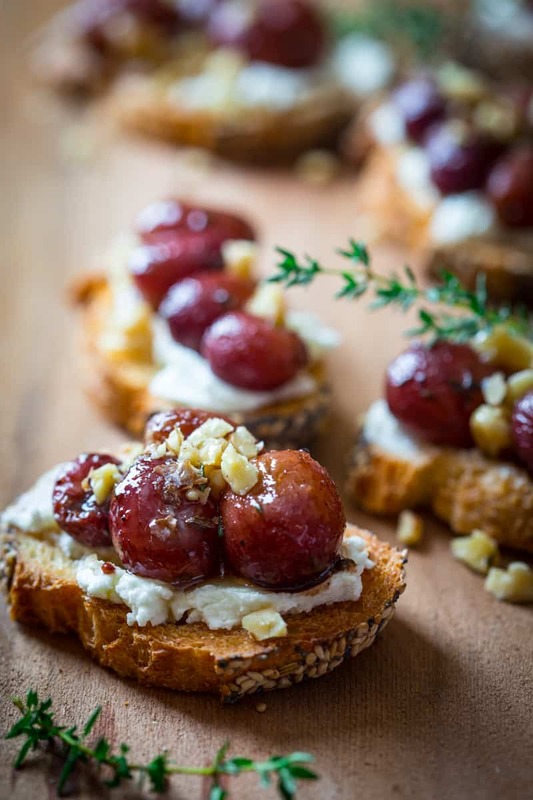 Slow-roasted grapes served on top of toasted baguette crostini with goat cheese, walnuts and a drizzle of honey. An elegant appetizer or serve after a meal as a cheese course. Preheat oven to 325 degrees F. Coat a large glass baking dish with cooking spray. Stir grapes, oil, salt, thyme and pepper in a medium bowl. Spread out in one layer in the baking dish. Roast, stirring occasionally until wrinkled and caramelized, 48 to 55 minutes. Remove from the oven. Drizzle balsamic vinegar over the grapes, and stir to coat. Set aside. Spread goat cheese on the baguette, dividing equally. Top with the grape mixture. Sprinkle with walnuts and drizzle with honey. Thank you so very much Yvonne. I appreciate it, and thanks for coming by. Normally I would totally think the same thing, I don’t know what overcame me. I even balanced my checkbook! Oh how this makes me want to try roasted grapes! Such a beautiful looking appetizer! Thanks so much Emily. Glad to hear it looks good to you. We loved them. These crostini look so beautiful and appetizing. 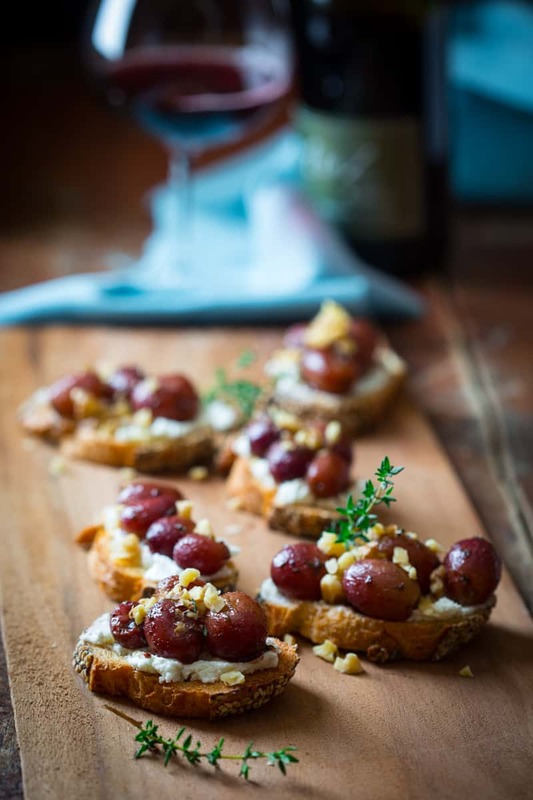 Sweet roasted of grapes and creamy goat cheese…a perfect pairing. 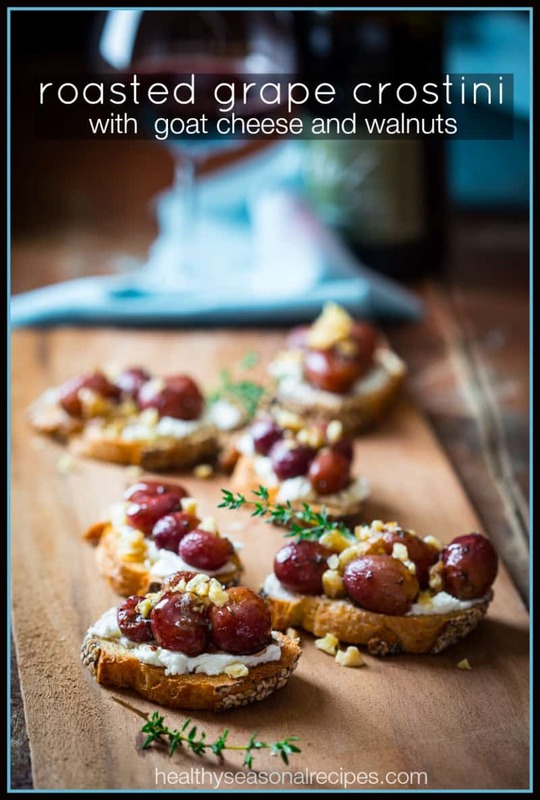 Grapes and cheese have always been good food friends afterall! I’d make these for a gathering of neighbors but at least one cannot tolerate goat cheese. What would be a good substitute – cream cheese? Brie? I think brie would be great. Thanks for asking. Please stop by and let us know how the substitution works out. My weekend is usually a lot like yours. Running around crazy, trying to make and shoot recipes and then feeling too exhausted to write about them by the end. But it usually all works out. Especially when you have a family member to remind you how good they were! Ha ha, that was a surprise to get the phone call from Jase the next day. Loved that! Thank you so much for the compliment Sarah. This is a beautiful appetizer that I can’t wait to give a try. Thank you so much Allie. And I am glad you came by. It is grape picking time over here in France and your appetizer looks just what we need to serve for our next apéritif. Ahhhhh, Merci! Ooh, I’d love to come over for a visit some time, a glass of wine and a few bites to eat! Enjoy the harvest! Thank you David! I love roasted grapes, they are so sweet and carmely. What gorgeous photos! The recipe sounds good too. Thanks for the reminder about roasting grapes. I love them with farro for breakfast in the fall. I’m looking forward to making this appetizer for an upcoming gathering and sharing the recipe with my friends at the gym! What fun! Hope you have a great time. Thank you Karen, and as for the energy burst, it was a miracle for sure. I got down to file some stuff from two years ago. Ha ha. The perfect appetizer IMO! Beautifully done and I love the sweet and savory thing. BTW, you energy level inspires me!!! LOL! Thanks for letting me know Jessi. I didn’t get a pingback yet, so I am glad to know of it. I will come by for a visit. How do I access the comments on this recipe. I imagine some have fond improvements or suggestions to make this easier or better. I just came across this beautiful recipe! I know it was posted some time ago, and someone did mention the goat cheese and brie. Unfortunately, I am not a fan of either of those. I like blue cheese, and I like the Boursin type cheeses, cream cheese, etc. is these something else you could recommend? I would like to bring these to Thanksgiving. Thank you, and Happy Thanksgiving to you! I think a blend of blue and cream cheese would be good. Or softened full-fat cream cheese would also be great. Enjoy! Could you roast the grapes the day before and assemble the day of? Yes you can. Just bring them back up to room temp before you assemble them. Hi Katie, I’m wondering how long the grapes would keep if you don’t use them all at once? Hi Joshlyn, You can keep them in a sealed container for three days. They will be kind of tacky when they are cold, so rewarm them before serving. 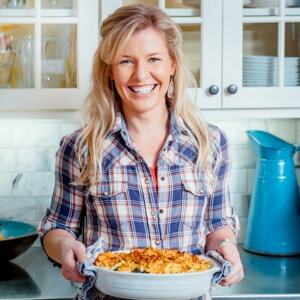 Thank you for sharing your Greek and Mediterranean-inspired recipes with us! 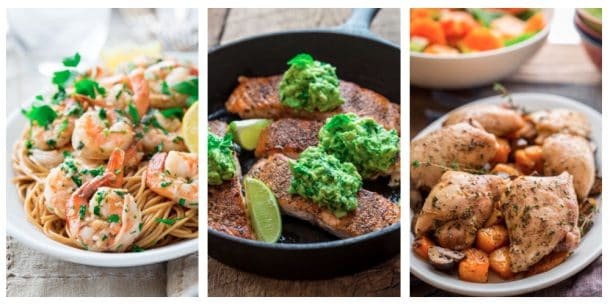 May I share that a smaller, less dominating picture would NOT make such an impact on the use of our VERY expensive ink-jet printer ink used to print these recipes???? Very wasteful, and could be accomplished with a smaller picture as is done on other sites. Also, printing the ad is gratuitous and wasteful, as well. Some minor adjustments could alleviate this waste for your viewers. Thank you. Printing online recipes is gratuitous and wasteful, as well. Some minor adjustments in your life could alleviate this waste for our planet. (Like, saving recipes on Pinterest or using any other online tool out there.) Thank you. Hi Andy. I do admit that I prefer to print the recipes when I cook them because I don’t like to have my computer in the kitchen with me. I only print them when I am actually cooking them, and use Pinterest to save them for later. I also re-use the paper and then recycle it. I am glad you like the recipe and that you grow your own grapes! We have them here locally, but I have never planted them on our property.